Download BiomeTable at the Download page. Following this guide will ensure that no buildings are spawned within Land of Dregora. Step 1. Navigate to: plugins > OpenTerrainGenerator > worlds > world_dregora > WorldBiomes. - You'll see CustomStructure() being highlighted, if this is the case remove the entire line. - You'll see CustomStructure(somestring) being highlighted, if this is the case remove the entire line. - Nothing happens after clicking enter. If this is the case no action is required. Step 6. ( Extra No Buildings Check: ) Navigate to: ServerBuild[X] > Dregora > Minecraft > plugins > TerrainControl > worlds > world_dregora > WorldObjects and erase the CustomStructures File. This will ensure that no buildings will spawn! Step 7. Make sure you check the startup log once you completed all steps above. If a error, somewhat like this: **Can not find CustomStructure in TemperateblaBiome at line 312** shows up navigate to the biome in question and erase the custom structure line. Step 2. Stop server, navigate to /yourserver and locate bukkit.yml. Replace the "generator: TerrainControl" to "generator: OpenTerrainGenerator"
Step 3. place OTG in /plugins & start server. Step 4. Start server. ( Do not remove TerrainControl ) & login to your server. Step 10. if not successfull retrace step 1 to 10 and make sure to read the console log. Step 11. Let the world generate. Once completed, shut down the server. Step 14. place the contents of /OpenTerrainGenerator/worlds/world_dregora inside the /OpenTerrainGenerator/worlds/world_dregora map. The Java instructions are only if you have issues installing java. Please try following the main installation instructions prior to following this guide. Other Issues? Go to our FAQ for possible solutions & links. Step 1. If you have not already, purchase or Upgrade your existing membership to include the Denizen's Realm. Step 3. Make sure you have TerrainControl or OpenTerrainGenerator properly installed. If not, install it and start up your server at least once. Step 4. Shut down your server. Step 5. Delete the denizen folder and the following plugins: Denizen, Depenizen, Citizens and Sentinel. Step 7. Extract the .zip on your desktop and place the plugin folders in your own /plugins folder. Ignore the .jar plugins if they are included in the download. Step 8. Start up your server and give it some time, since the plugin needs to load your worlds for the first time. Step 10. Investigate the contents of this plugin folder to get familiar with the folder layout. It is a good idea to read the first sentences of the top files as well as this will give you an idea of what file controls what. Step 11. Configure all the settings to your likings, save the files and start up the server. Step 3. Extract the .zip on your desktop and place the plugin folders in your own /plugins folder. Ignore the .jar plugins if they are included in the download. Step 4. Start up your server and log in. Step 1. Navigate to the folder: /plugins/denizen and make a backup of all content within the /denizen folder. Step 3. Navigate to the folder: /plugins/citizens and make a backup of all content within the /citizens folder. Step 5. Replace the /plugins/dregora folder with your backup. ( There may be an issue with /craftrealms/dregora here ) If this is the case contact NLBlackEagle on Discordand he will help you. Step 6. Replace the /plugins/denizen folder with your backup. Step 8. Congratulations! You have successfully migrated your server. Step 5. your settings should have been updated and active in game. If you think there is an issue, check your log files and contact us on the OTG Discordserver. ✓ Intense research to get something done. ✓ TerrainControl will overwrite any BIOME put in by a mod pack. You can however use the blocks of this biome pack and create the biomes yourself. ✓ TerrainControl has a option in the biome.config file where you can allow regular Vanilla structures like villages, temples and so on to be generated. ✓ Don't ask questions unless you have done some basic research. People don't like to repeat their selves over and over. If you'll do anyway you might not be assisted the next time when you have a serious issue within TC. By reading this tutorial you should already have the basic knowledge on how to create Biomes and alter their basic settings. If not follow this tutorial first: TerrainControl by Samkio And experiment for a while to see what features it has. Mountain biomes basically exist out of isles. Lets take 0.7 as biome height for the first biome, mountainrange as example. And, please don't rush to get a notepad open or something similar, all that you need to do for this part of the tutorial is read. The second biome will be placed as a isle within the mountainrange biome at biomeheight 1.5 ( Determined by how high you want your mountains to be ) This will function as mountainbase. You do the same thing with the next biome as isle within mountainbase. If you decided to go try this out anyway You'll see a big ugly stake growing out of the ground. That's since these where the basics of the basics on creating a mountain. For this part you may grab your notepad since we will be actually building a mountain from ground up! First we open up the MountainRange biome config and take a look at the biomesize. The size goes from -10 to 10 I suggest somewhere in between 2-5. Then the Biomerarity, since this is a 'normal biome' just like plains or desert you may leave it at 100 unless you want mountains to be rare but I suggest you dont go any lower then 95. It is also wise to search hexcolor on google and pick a color you like to use for this biome map which can be generated by using the /tc map in game. You could also use /tc map -500 to create a bigger map. The volatility is something I can't explain, its more like a feeling combined with experimenting to give you the wanted results. Now, since we have used BiomeSize 6 for Mountain range We'll use Biomesize 8 for this setting. If you decided to take BiomeSize 2 then set this biome anywhere from 3 to 8 ( The higher the value the smaller the biome will be ) This is very important since if You use a lower setting the biome would not even generate. If this is your first time I suggest you use the settings I've used. With this setting the main biomes for mountains have been finished! Yet we will be adding a BorderBiome which functions partly as slope, partly as border to make a nice transitions between the mountains and all other biomes. I have used BiomeHeight -0.6 This setting and all other BiomeHeight settings may be different for you if you use different GenerationDepths. I also have my ground level and water level set to about 70. A Bo3 is a abbreviation of Biome Objects ( Version 3 ) and are used in TerrainControl & OTG generated worlds and can be compared to Schematics, this can be a Tree or a house which make Bo3's essential to any world. Let's imagine walking in a vanilla world where we see a tree and walk 5 miles to the north where we see the same tree. Pretty boring right? So lets grab some wool and make a cherry blossom tree to spice things up a bit. But hey, why not add 100 cherry blossom trees? And while we are at it why not create 100 different trees and place them all over the world making unique forest like landscapes in all shapes we could imagine! This is where the bo3 comes in which allows you to not only add trees but also rocks, structures, towns, dungeons and even cities with no limit on how big you want them to be! What do I need to add in Bo3's? Convinced and ready to create a couple of your own Bo3's? Step 1. Shut down your server, download the Bo3Tools plugin and place it in your plugins file. You may start your server up again after you have completed this. Do note that you do need a working Terrain Control world for this to work! Step 2. Navigate to your world ( Ingame ) and create something, like a tree. Step 3. Select the outlines of your creation with WorldEdit. Step 4. Now you can export the structure using /exportbo3 bo3name You can also use special selectors. Click here for more information. Step 5. Once you have exported the world navigate to your /plugins folder -> /terraincontrol/globalobjects & open the /bo3name.bo3 file with your favorite text-editor. Step 6. Read the Bo3 File Example below to get a idea of how to work with the functions and file structure and change the settings in your bo3name.bo3 where desired. Step 7. Navigate to your /plugins folder -> /terraincontrol/worlds/yourworldname/worldobjects and place the bo3name.bo3 you opened earlier here after you saved your changes. Step 8. Navigate to your /plugins folder -> /terraincontrol/worlds/yourworldname/worldbiomes and open the biome.bc file where you want to put your object in. Step 11. Right above these lines you should see: CustomObject(UseWorld). Add CustomObjects() beneath that line. Step 13. Save the file and startup your server! If you do not see your Bo3 try to adjust the Frequency setting. Also double check your BlockChecks. # The BO3 version, don't change this! It can be used by external applications to do a version check. # The settings mode, WriteAll, WriteWithoutComments or WriteDisable. See WorldConfig. ● WriteAll: OverWrites any faulty lines and adds in a basic explainatyion on the function of a setting. ● WriteWithoutComments: OverWrites any faulty lines without basic explaination on the function of a setting. ● WriteDisable: Prevents TerrainControl making any changes to the current bo3 file. # This needs to be set to true to spawn the object in the Tree and Sapling resources. # The frequency of the BO3 from 1 to 200. Tries this many times to spawn this BO3 when using the CustomObject(...) resource. # The rarity of the BO3 from 0 to 100. Each spawn attempt has rarity% chance to succeed when using the CustomObject(...) resource. # If you set this to true, the BO3 will be placed with a random rotation. # The spawn height of the BO3 - randomY, highestBlock or highestSolidBlock. but wont spawn on non-solid blocks like Water and Lava. ● Want to spawn your structure partially underground? Use this setting! ● Example: use SpawnHeightVariance: -3 to spawn the object 3 blocks lower. # The height limits for the BO3. # maximum branch depth for this objects. ● This setting only applies when you are creating/exporting a custom structure which allowes bo3's bigger then 32x32 blocks. # When spawned with the UseWorld keyword, this BO3 should NOT spawn in the following biomes. # If you writer.write the BO3 name directly in the BiomeConfigs, this will be ignored. # The block(s) the BO3 should spawn in. ● The blocks you want the structure to spawn in. For example when used in a cave with trees you could replace AIR with all ores and stone. ● I advice to not use any numbers below 10 unless you are know what you are doing. ● PlaceAnyway: This makes the bo3 spawn under any sourceblock condition. ● dontPlace: Use this if you dont want the bo3 to spawn outside the sourceblock. # fails, a 100% percent chance to have the contents of anotherchest.nbt. ● This functions as the container for your structure. Dont toutch this unless you know what you are doing. # Require a condition at a certain location in order for the BO3 to be spawned. # You can use "Solid" as a BlockName for matching all solid blocks or "All" to match all blocks that aren't air. ● It might seem pointless to explain this however when you are going to use advanced blockchecks it will come in handy! # structures possible. See the wiki for more details. # Regular Branches spawn each branch with an independent chance of spawning. # branchName - name of the object to spawn. # rotation - NORTH, SOUTH, EAST or WEST. # Weighted Branches spawn branches with a dependent chance of spawning. Step by Step paint-in tutorial. This tutorial shows you how to put a CustomStructure in a exact spot without your FromImage World. Step 1. Open up the map.png inside /plugins/TerrainControl/worlds/world/ using your favorite paint program. Step 3. Paint in the Custom Structure like shown down below. 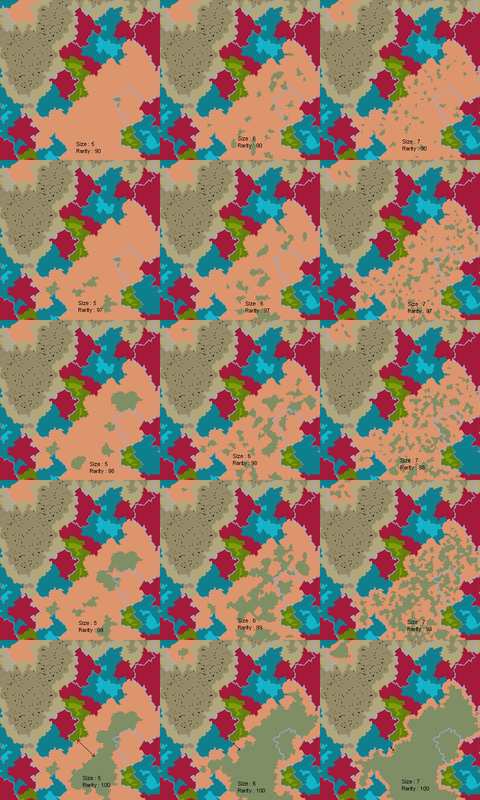 ( Click here & navigate to package guides -> Dregora -> Biome Reference For Dregora Biome Hexcolors ) NOTE: do not make the square larger then 5x5 pixels! Step 4. If the Bo3 appears to be double spawning make it 4x4 instead of 5x5. if the structure wont spawn at all try higher settings ( like 6x5 ). Save your progress and load up the server. Step 5. Teleport/Walk or fly to the Bo3Structure's location and /sethome since you will be restarting/visiting often! Step 6. If the structure is generated too high or low go to /plugins/terraincontrol/worlds/world/WorldBiomes and open up the biomeconfig you used to paint in the bo3. Step 12. Once you copied over the settings either lower or increase the height ( If you want the structure to be 10 blocks lower, lower the value with 10. ) and click replace in files. This will take a few seconds. NOTE: Do not press ok when it says press ok to cancel! Step 13. Copy the content of the bo3test file to your /plugins/terraincontrol/worlds/world/WorldObjects file, stop the server, delete the content of /world/regions/ and start the server. Step 14. Repeat steps 10 till 13 until you have the desired effect, enjoy your structures! I see you are using your mobile phone. To save you a trip through the empire state libary we decided to hide this page for visitors using their mobile phone.